Russia has agreed to upgrade a second batch of eight Peruvian MiG-29 fighters, after having completed the upgrade of the first batch in 2012. 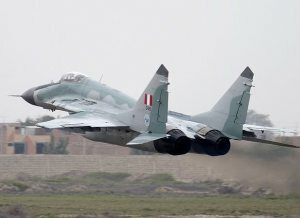 LIMA, Peru --- Russia and Peru will sign a contract to upgrade Lima's fleet of Mikoyan MiG-29 Fulcrum fighters by the end of May, Konstantin Biryulin, deputy head of Russia’s Federal Military-Technical Cooperation Service, said on Monday. Belarus sold around twenty of the fighter jets to Peru in 1997. Peru signed a contract in 2008 for Russia's UAC MiG to upgrade eight of the original MiG-29S standard aircraft to MiG-29SMT standard. That work was completed in 2012. Biryulin did not specify which organization would carry out the next upgrade or what enhancements it would include, or how many aircraft are involved. Russia completed a $20-million upgrade last year for Peru's Russian-built Mi-25 attack helicopters. The Peruvian air force operates a total of 16 Mi-25 and Mi-35P helicopters. Peru is also considering buying 100 T-90S tanks, Russian state arms corporation Rosoboronexport said on Sunday. Peru currently operates around 300 obsolete Soviet-made T-55 tanks, which Lima wants to replace with T-90S’s. Russia and Peru signed a military-technical cooperation agreement in 2006.